I recently mended and made folders for items in a Lilly Library manuscript collection. The collection contains the papers of Charles A. Halleck, who served in the U.S. Congress from 1934 to 1968. 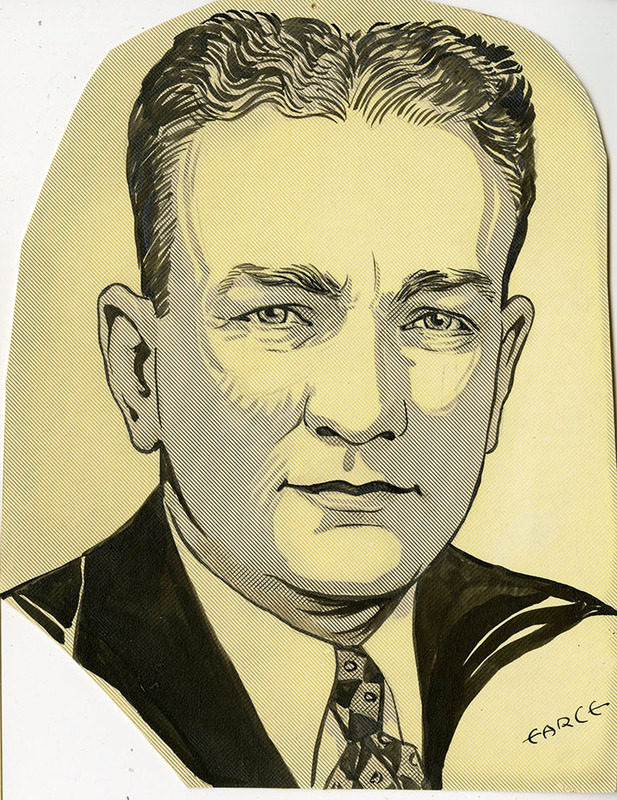 There was nothing unusual about the contents of one particular box, just original drawings of political cartoons and ads regarding the congressman from the mid-thirties. Then I looked a little closer at one of Halleck’s portraits. The hatching in the illustration looks too good. It looks manufactured, not hand-rendered, but the perimeter of the shaded areas follow the form of brush strokes, just like on Halleck’s inked lapels. I found two other drawings of Halleck with the same perfectly hatched and occasionally crosshatched tones filling out the shadows on his face and neck. Fortunately, the backs of the illustration boards are marked “Craftint Doubletone,” so that’s where I started my search. The Ohio-based Craftint Manufacturing Company offered Doubletone and a similar paper called Singletone from 1929 until they sold the product to the Ohio Graphic Arts Center, now Grafix. 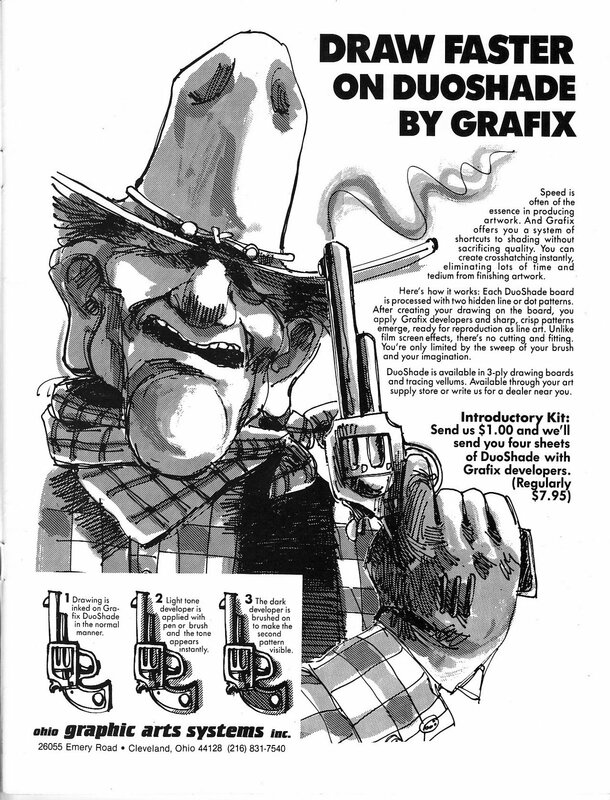 Grafix renamed the product Duoshade and it was available until 2009 when it was determined obsolete in the face of programs like Adobe Illustrator, and discontinued. A 1988 Grafix Duoshade ad from Wittyworld Magazine. From Mike Lynch Cartoons, http://mikelynchcartoons.blogspot.com. Twentieth century reference books and journal articles describe Craftint’s seemingly magical paper as an illustration board with a latent pattern on its surface that, when brushed with a liquid developer provided by the company, appears where desired. In these books, there is no mention of the chemical response in these latent patterns. However, as commercially successful products, I knew there must have been a patent on them. 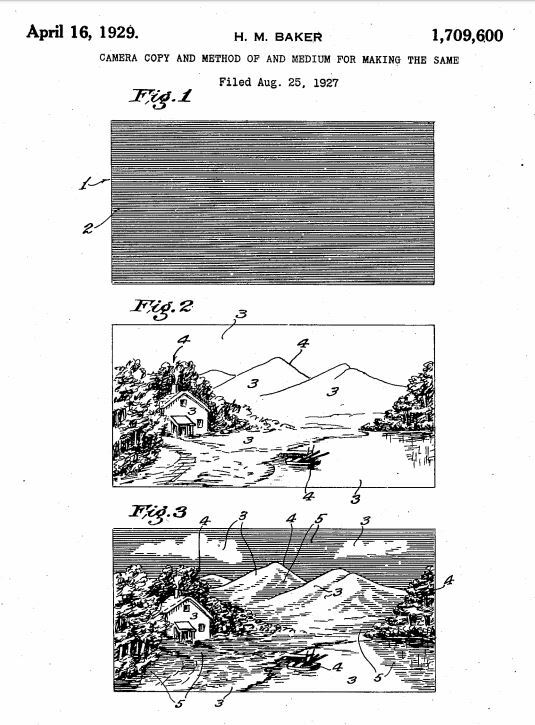 After some digging, I found an application filed by Henry M. Baker in 1927 and patented in April 1929, the same year that Craftint started offering its product. Baker explains that by developing a silver nitrate image (a pattern of dots or lines) and blanching it with a substance like mercuric chloride to render it undetectable, a sensitized and lightfast image remains dormant until activated with a liquid developer. Illustrations from Baker’s patent showing the linear pattern (fig. 1) before it is blanched. Figure 2 is the finished ink drawing, and Figure 3 is the completed illustration with the redeveloped tones throughout. Baker does not specify the chemical agent used to redevelop the pattern in his application. However, a patent issued to Carl Maier and William Swaysland in 1930 also listed on Craftint’s July 1948 product catalogue uses a different approach, by which a lead sulfate (lead white) pattern is applied to the paper’s surface and a soluble sulfide is brushed on where desired, turning the lead sulfate to lead sulfide, a dark compound. And if you made a mistake on the paper? Hydrogen peroxide would convert the lead sulfide back to a white compound. Other inventors built off Baker’s initial process, leading to various combinations of chemicals and developers. A few detail images of Halleck’s inked portraits show the blank, undeveloped surface, the India ink drawing, and the developed pattern. Since these images are on Craftint’s Doubletone paper, there are two different patterns printed on the paper’s surface. Independently, the patterns make up two groups of parallel lines that, when both are activated, appear as crosshatching. A light tone developer makes visible one set of lines. For a darker tone, another developer is applied, but only after work with the light developer is finished. 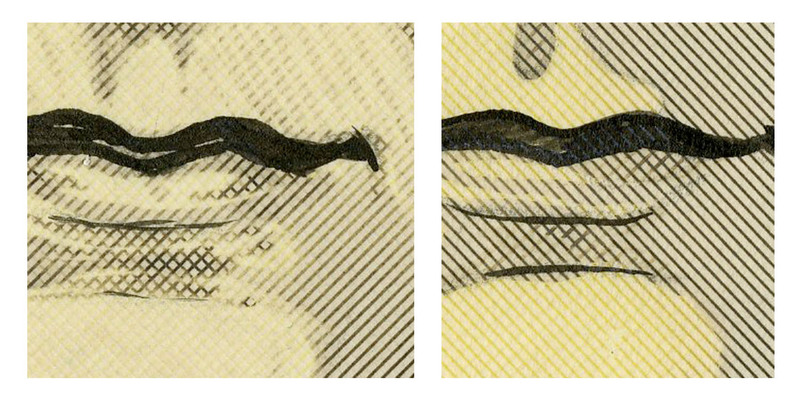 Detail of two depictions of Halleck on Craftint Doubletone. The left illustration was drawn on Doubletone No. 202, the right on No. 213. Time has affected the paper, making what was a previously hidden pattern of undeveloped lines more visible. What made Craftint toned papers so useful for twentieth century graphic artists? The potential to bring out large areas of tone with no more effort than a brush stroke is one of Craftint’s most attractive qualities. Compared to hand-rendered hatching and stippling, the results would be swift and concise, and mistakes were easier to hide via hydrogen peroxide than scraping or masking ink. Other methods of achieving tones and patterns were not always as effective and, in the case of halftone reproduction, not as affordable. Ben Day dots, as they are known now, did not offer the same precision as Craftint’s toned papers and had to be applied one large area at a time and burnished to complete the transfer of pattern, although they were available in a variety of colors. The tonal variety seen on and around Halleck’s mouth would have been difficult to achieve with Ben Day dots. Additionally, Craftint reproduced well at reduced sizes. 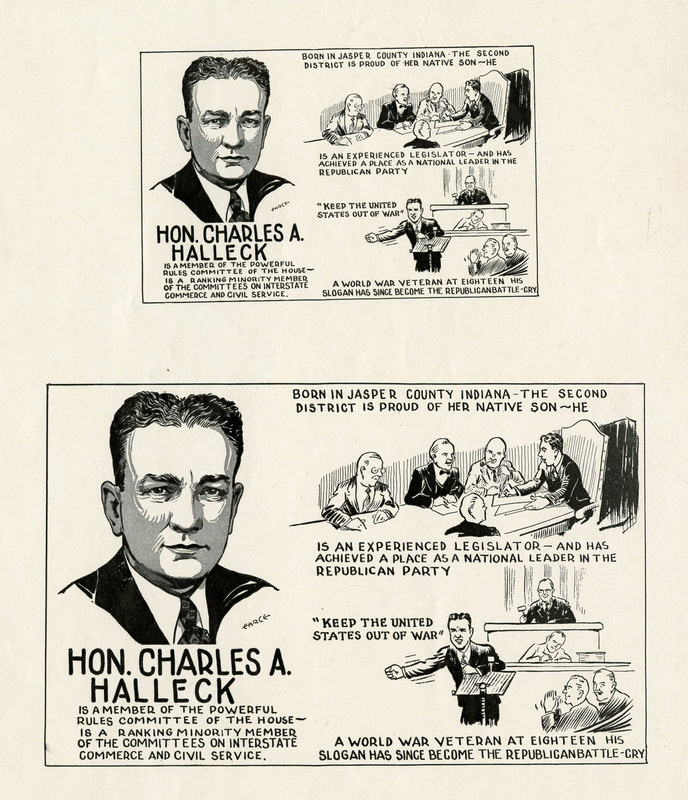 A proof of Halleck’s ad shows the artist’s rendering reduced to smaller than one-quarter of the original. At such a size, the hatching on the original appears as a smooth, even tone across his face. Printer’s proof of Halleck’s ad with Doubletone illustration. This process is very far from magic, though it surely seemed that way for artists. After dipping their brushes in clear liquid, the path of their brushstrokes immediately turned dark as it traveled across the paper. The phenomenon was easy to overdo, leading to images with many toned areas that, when reproduced into small comic strips and magazine ads, turned out cluttered and unclear. Artists commended peers who knew when to stop. Anderson, Murphy with R.C. Harvey. 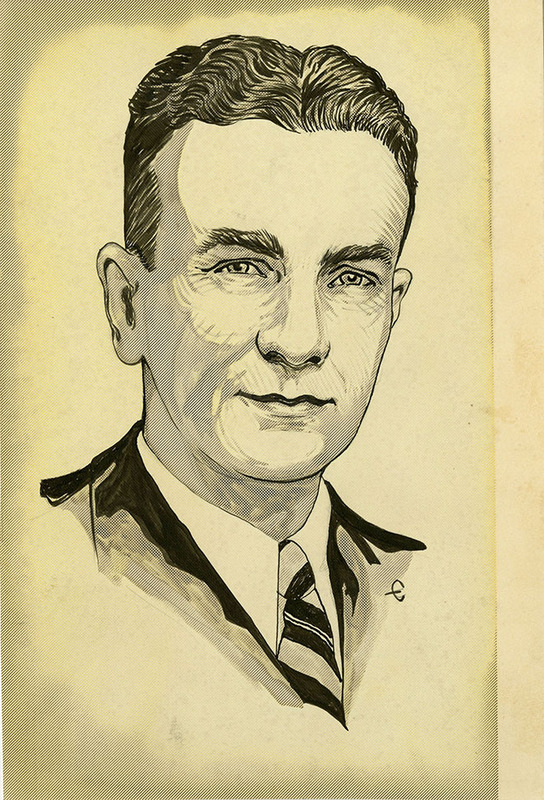 The Life and Art of Murphy Anderson. North Carolina: TwoMorrows Publishing, 2003. Baker, Henry M. Camera copy, and method of, and medium for making the same. 1709600, 1929. Ives, Ronald L. “Fabricated Diagrams.” The Journal of Geology, Vol. 47, No. 5 (1939): 517-545. Maier, Carl and William Swaysland. Method of producing designs and article for use therein. 1778397, 1930. Wallace, Clarence Earl. Commercial Art. New York: McGraw Hill, 1939.